Fancy a night of two-tone in south London? After reforming in 2008, The Specials have impressed crowds at gigs and festivals across the country. They'll be back in London - at Brixton Academy - on 31 October. Tickets available here. 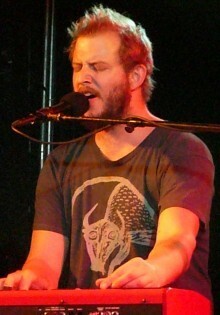 Indie-folkers Bon Iver have steadily built a big following for their introspective, dramatic songs, driven by frontman Justin Vernon's vision and falsetto voice. They'll swing by the Hammersmith Apollo on 24 November. Pick up tickets from here. Turntablist extraordinaire DJ Shadow heads for three nights at the Village Underground on 7, 8 and 9 September. Using his considerable skills to combine samples and create songs on the fly, expect a showcase of his album, due out around the same time. Tickets on sale here. American metallers Deftones will play Reading Festival at the end of August, and to get ready they've booked a date at the relatively-small-by-their-standards Shepherd's Bush Empire on 24 August. Tickets from here. You can rely on Toots and the Maytals for uplifting reggae that'll get you dancing. See the Jamaican music giants at Brixton Academy on 9 September. Get tickets here. It's a Friday evening, so you can make a night of it. Good grief, it's like battle-of-the-boybands this week. Plucky upstarts East 17 play O2 Academy Islington on 22 July, and extra tickets will be available for stadium-filling Take That's tour at the end of the month.